Finding a cold-weather appropriate dress for all us gals who live in a frigid climate can be a difficult challenge. When I saw this adorable plaid dress at JCPenney I scooped it up in a heartbeat...and I didn't even have a coupon! Gasp! Although I did get it on sale for 40% off. I just knew if I passed on this dress it would be gone in a heartbeat; and I was right. It was no where to be seen on my next visit to JCPenney. This is such a cozy and comfy dress for us northern gals. First, it has long sleeves! How often do you see that in a dress? Second, it a soft, warm fabric, three, it comes with a matching infinity scarf, and finally it's short enough that it would work as a tunic over leggings as well! 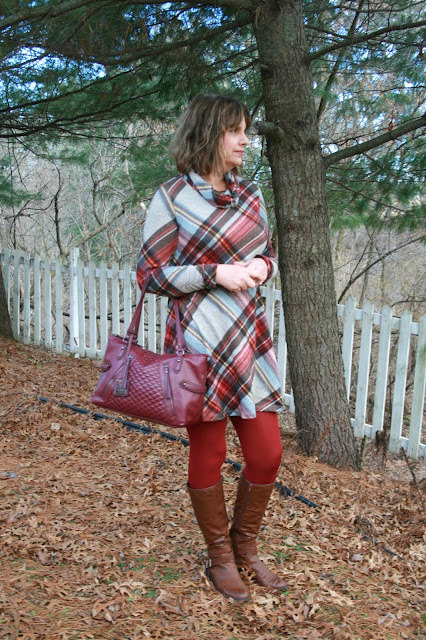 I absolutely love the colors and the plaid design: perfect for fall/winter! Because of the long sleeves and infinity scarf, I didn't wear a necklace or bracelet but chose brown earrings and my usual rings. I wore burgundy tights and tall cognac boots to keep my legs warm. For outerwear, I chose to wear my shearling/suede vest as it was only in the upper thirties/low forties that day and I was just running from the car to a building. I carried my usual burgundy bag to match all the other burgundy in my outfit. I wish I could find a link for this dress, but unfortunately I couldn't find it on the JCPenney website. Like I said in my opening paragraph, these type of dresses disappear fast (you would think buyers would get the hint and provide more of what the consumer wants). I would check your local JCP store, maybe you'll get lucky! How cosy! What perfect colours for this time of year. Glad you made an instant decision and bought it. I would have dithered and been disappointed. Hugs, x. Thank you! Waiting till I have a coupon or it goes on a better sale is my usual action, but I trusted my gut and bought it on the spot because I knew it would be gone. This is such a cute plaid dress for the holidays! I absolutely love that you paired it with red tights, because it really ties the whole outfit together. These colors are so perfectly festive! Thank you! You know, I haven't thought about wearing for the holidays but so many people seemed to comment it would work well for the holidays so maybe now I will! That dress is so cute! 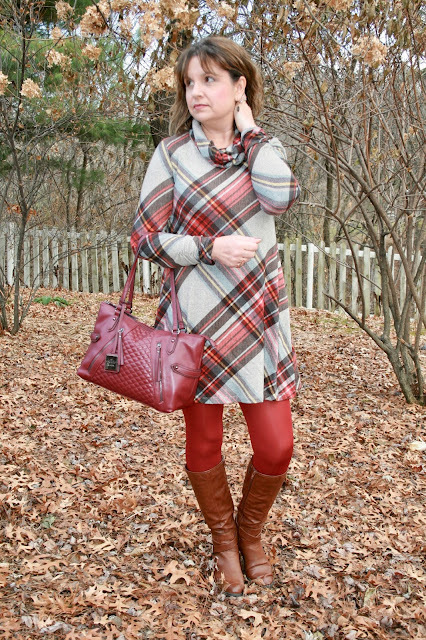 I love the plaid pattern and the colors make it perfect for the Holidays! Hi Amy, I love the shape of your dress - fitted at the waist but with a swingy skirt - it's really flattering on you, it goes really well with your knee-length boots, and as you say, it's versatile. I know that checks (plaid) are in fashion this season, and I have a checked woollen skirt in similar colours to your dress lurking in my wardrobe, so I think I'll bring that into circulation soon! Thank you! It's normally so hard to find a dress that fits me well, I got lucky! This dress is super cute on you Amy! Hope you have a wonderful weekend! After a crazy week I'm hoping to do a little bit more for Christmas, getting those last few gifts and doing some more wrapping! Thanks Mica! I hope you get all your Christmas things done! Loved the photo of this adorable outfit on Instagram. Sad to read that the dress isn't available or at least you were unable to find a link for it. Going to run by JCP.com just in case anyway. This dress is just perfect! I know, it's such a bummer the dress wasn't on the JCP website, I just bought it too! I hope you find it in store. That plaid dress is so cute! Love the plaid and the red stockings Amy! Thanks for sharing with us at #overthemoon. Have a great week! Amy this is gorgeous. I need a plaid dress now, and red tights. I have to find red tights. Love it. Thanks Anna! You know, it's amazing how difficult it is to find colored tights! When I see them, which is rare, I grab them! That plaid dress is DARLING! And I *LOVE* a swing dress. The vest you out over top is perfect, what a great cold weather outfit! I found you through the StyleSplash link up and I'm glad I did! Thank you, and thanks so much for visiting, I'll be over to check your blog soon! As someone who wears a dress basically all the time, I see exactly what you mean. I am always looking for nice, warm dresses. I have thought about getting a plaid one before. They are harder to find! How super cute is that dress?!?!?! And it pulls double duty as a dress and tunic? You definitely scored a real deal. Thanks for linking up to Top of the World Style. This plaid dress is so cool. Great styling. As always you look so cute! Thanks so much Nicole! You're always so kind! What a pretty pattern Amy! I love the red plaid and the brown boots. i have a few plaid jackets I need to wear. looks great!